Buntingford's first Twin was the French town of Luynes in the Loire Valley. This "Jumelage" occurred over 30 years ago in 1978 and since that date there have been many exchange trips. 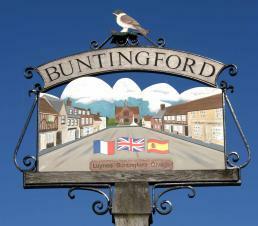 The Town Council took on the organising of the twinning until around 1984 when a new organisation of interested residents was formed, the Buntingford Twinning Association which operates separately from the Town Council. In 2006 the second twin took place with Olvega a small and prosperous town in northern Spain. Once again regular exchange trips take place. A small peaceful village situated right next to Buntingford with a large park and a lovely country pub. There are a number of pleasant footpath routes between the two. Westmill is situated close to Buntingford, amongst the countryside. It has a lovely village green where you can enjoy a lovely cup of tea at the Westmill Tearooms or visit the Sword in Hand PH. Cottered is a small village situated in between Buntingford and Stevenage. It has a large recreation ground as well as village hall in the centre of the village. The Bull is a popular pub and restaurant. Reed is a small quaint village about 3 miles away from the market town Royston. It has a village green regularly used by cricket teams and a popular country pub. It is a tranquil historic village with buildings dating back to the 15th and 16th century. The village also has a large recreation ground which is regularly used and also holds the annual Barkway Market in May. Hertford is the historic county town with a variety of shops, cafes and restaurants. St Andrew's Street is well known for its antique shops and boutiques. Market Day is Saturday and there are regular Farmers' Markets.